The sand was firm. 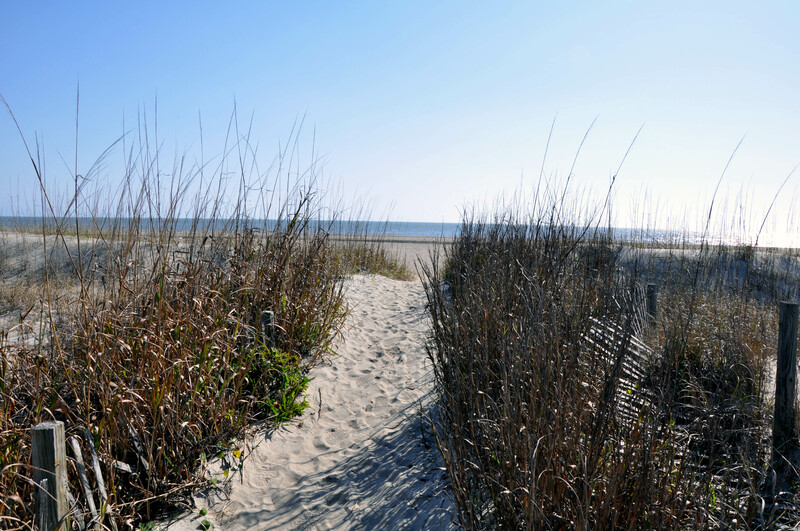 We walked the beach and captured photos of albatross, seagulls and sandpipers skipping and dancing about the shoreline. I know this sounds cliché, but some say surprises happen when you least expect them. Like a message in a bottle cast by a sailor to the sea, our surprise came in the form of a plastic chair recently washed ashore. Encrusted with camel-colored sponges and seaweed, it was a curiosity in its own right. A gentleman happened along, just as the chair was rushing the beach. 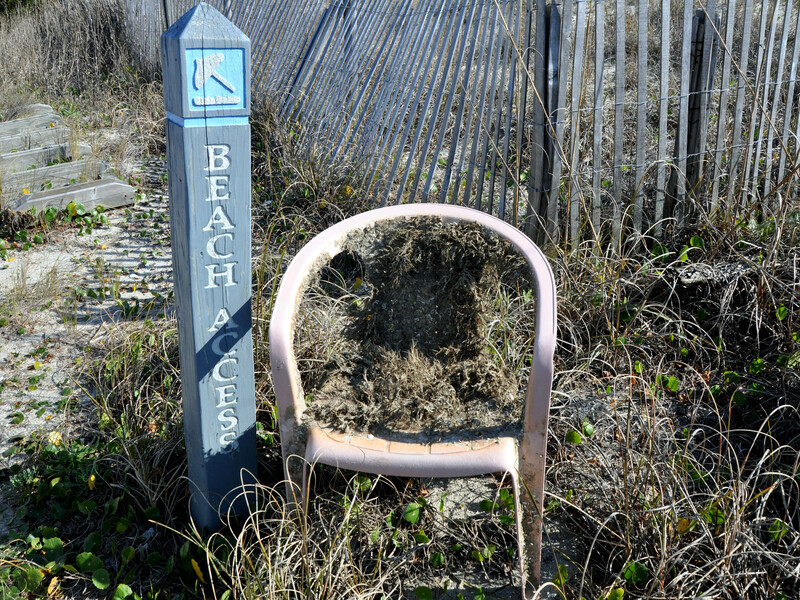 Rescuing “sponge chair”, carefully he carried her across the sand, and up the dunes walkway. He set her down, gently, adjacent to the blue beach access sign. My husband, shot several photos of the chair for friends and family back home. Within minutes, another gentleman reclaimed “sponge chair”. We promised to send him a photo and urged him to email me as a reminder. He whisked “sponge chair” off on another adventure — a ride secured on the back seat of his golf cart. How long had “sponge chair” been in the deep blue? The plant growth seemed pretty mature. What released it from its embrace with the sea? A storm? Shifting sands? The tides? It’s almost romantic to envision. 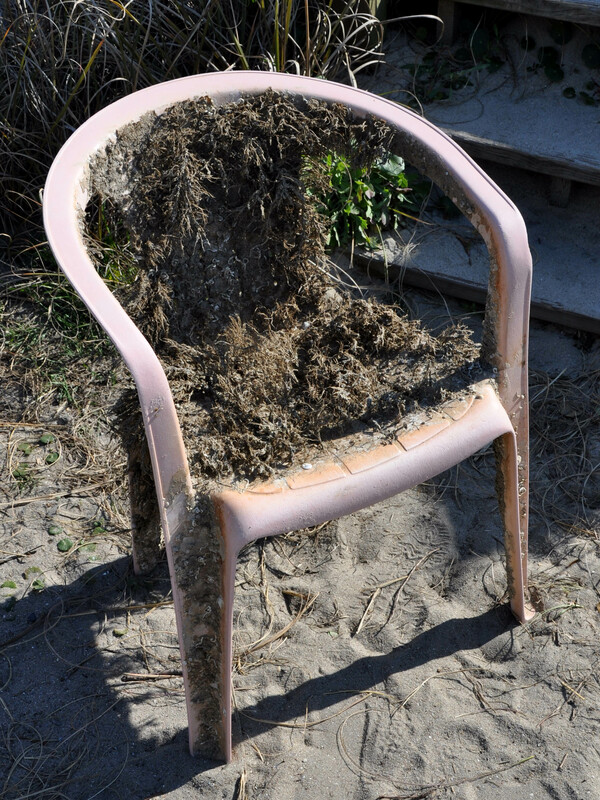 I’m confident that “sponge chair” provided nourishment and a safe haven for a plethora of ocean life. Or even a lair for predators. And just as the chair was sacrificed to the sea as an offering, the sea spat her back out when she could use the chair no longer. And so life continues, exhibiting universal beauty – a oneness, and connectedness to each other. Within the soul, is the whole of mankind. Please enjoy “Ode to Sponge Chair”. She settled softly, in the ocean depths. her plant growth sustained vibrant marine life. Fish found refuge in her embrace. The deep blue regurgitated her. Curious, my husband photographed her. and no doubt gave us something to talk about for awhile. Thank goodness, the gift from the sea wasn’t a mermaid! This entry was posted in Faraway Places, General, Nature, People, Photos, Poems, Things That Make You Think by shereenielsen. Bookmark the permalink. Thanks Laurie. Glad you liked it! I loved Anne Morrow Lindbergh’s books. Her prose was extraordinary. What a wonderful surprise on the beach. What a great story, Sheree. You really made me think about just what sea life “sponge chair” must have experienced on its journey. So many things that go on beneath the surface of our awareness! Thanks for taking me to one of my favorite places, the beach, with your beautiful description. Awh…Thank you so much Theresa. I am so glad you enjoyed it. The beach is definitely my favorite place to be!